Over 5,000 people from across India stormed the Parliament Street demanding a return of their hard-earned money invested in PACL. The total amount of the scam is stated to be approximately Rs. 50,000 crore. Like Gita and Manisha, over 5,000 protesters stormed the Parliament Street in the heart of Delhi, giving a final warning to the Modi government with barely three months to go for the general elections. Over 30 crore families of poor people, who had been scammed by the PACL, have still not been refunded their investment. The total amount of the scam is stated to be approximately Rs. 50,000 crore. The company which started in 1982, ran for 17 years and was luring the poor on the pretext of sale and development of agriculture land. The companies made false allotments of land to investors even though they did not own any land in their own name. “Currently, new assets of the company are being discovered from Australia. The company is allegedly worth Rs. 1.86 lakh crore, but the amount could actually be four times more amidst all of this,” said CB Yadav, an activist working with the protesters. In a major show of solidarity with the protesters, Gujarat MLA and activist Jignesh Mevani, and Sharad Yadav of the Loktantrik Janata Dal joined the protesters. 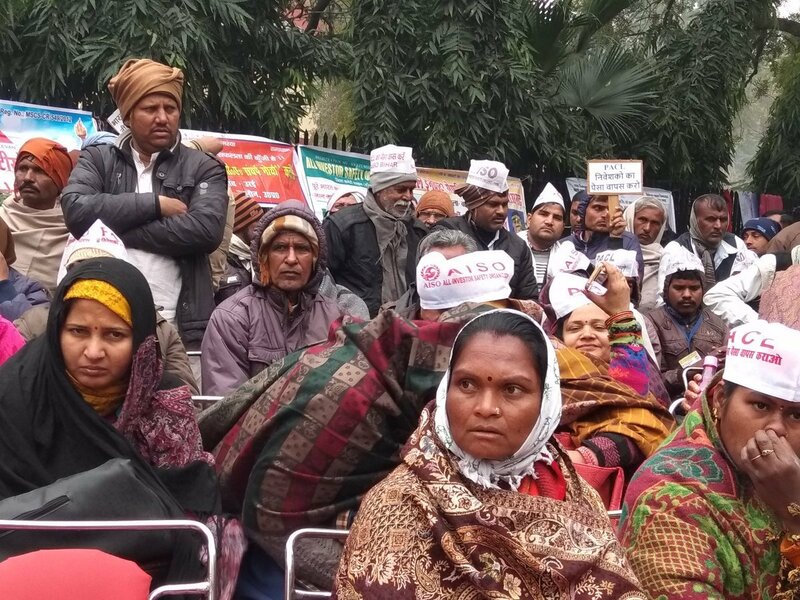 The protesters congregated in Delhi from across the country, including the agents of the company as well, who are currently facing the wrath of the people who invested in the firm before it shut down operations in 2014. The company also has an Australian connection. The Federal Court in Australia, in July 2018 observed that the money mobilised by PACL from investors was utilised for acquiring certain assets in Australia. As directed by the Justice RM Lodha Committee, Securities and Exchnage Board of India (SEBI) had filed a claims petition in the Federal Court of Australia seeking repatriation of the assets, or the proceeds thereof, on behalf of all the investors in PACL. The company had also roped in Brett Lee as its brand ambassador. In Australia, Nirmal Singh Bhangoo, the head of the company and several of his family members had teamed up with Gold Coast property developers Paul Brinsmead and Peter Madrers. The two Australians had operated the company Resort Corp, which developed large tracts of coastal land in the Tweed Shire in northern NSW before its group of 14 companies collapsed in March 2009. The first case against the company was filed by SEBI back in 1997, as PACL was running a Collective Investment Scheme (CIS) without SEBI's permission. In 2003, the Rajasthan High court rejected the orders of SEBI sent in 1999, stating that the company was not running any such CIS. In 2013, the Supreme Court set aside the order of the Rajasthan HC and asked SEBI to start a fresh probe against PACL. Finally, in August 2014, SEBI ordered PACL to refund the promised returns to the investors within 3 months. In response, the company approached the Securities Appellate Tribunal (SAT) against the Board. In August 2015, the SAT backed SEBI’s order and asked PACL to refund the money within 3 months. However, following government inaction as well as the political connections of the firm, the money was never returned to the families. On December 11, 2016, SEBI had initiated recovery proceedings against PACL and its promoters and directors, including Tarlochan Singh, Sukhdev Singh, Gurmeet Singh, Subrata Bhattacharya, Nirmal Singh Bhangoo, Tyger Joginder, Gurnam Singh, Anand Gurwant Singh and Uppal Devinder Kumar, for their failure to refund Rs. 49,100 crore to investors. More recently, in July 2018, the Lodha panel had shortlisted four firms to sell off the company. PACL had also proposed a plan to sell off assets that could recover Rs. 15,000 crore.